Weatherproof The Pin Out | MaxBotix Inc. 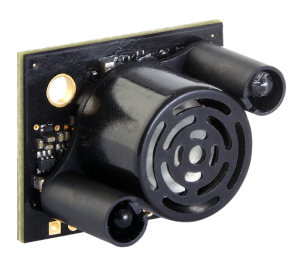 When you use a rugged WR sensor from MaxBotix Inc, the sensor pinout is exposed allowing you to attach wires and equipment to the sensor. While leaving the pin out open provides greater flexibility in how you choose to connect to the sensors, it can leave the sensors exposed to the weather in some applications. If your mounting requires you to protect the back of the sensor from damage, you must seal the sensor pinout against rain and other potential hazards. 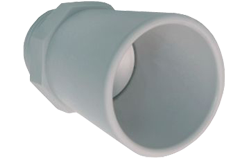 For users that want to purchase a fully sealed sensor, the wire attach option is a great choice. The wire attach option as seen in Figure 1: Wire Attach fully covers the sensor pin out with the addition of a small cap filled with an epoxy mixture and attached cable creating a weatherproof sensor. The additional potting on the back of the sensor seals the sensor against the effects of weather, dust, and water. 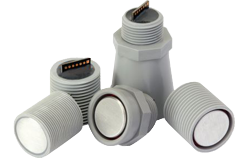 The wire attach option provides you with a fully IP67-rated waterproof sensor to meet the needs of rugged applications. For individuals with limited soldering experience, connecting wires to a sensor can be a difficult task. Additionally, no one wants to risk their new sensor with a first attempt at soldering. In these cases, the wire attach option frees you of the responsibility of soldering directly to the sensor and ensures that you receive a working sensor with professional, in-house soldering. All sensors purchased with the wire attach option are shipped ready-to-use with wire firmly attached and the sensor fully sealed. You receive a high-quality product ready to install in your final application allowing you to quickly get your sensor operating in the field. Picking up electromagnetic interference, EMI, is a common issue with cable runs. 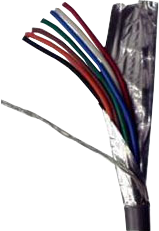 Unless otherwise requested, MaxBotix® Inc., uses a seven conductor shielded cable for all wire attach options. Using a shielded wire greatly reduces the impact of electrical noise or EMI on your range readings. MaxBotix® Inc tested and operated a MaxSonar® on a 1,000 foot run of our shielded cable, and experienced only a 0.1-volt drop while the power remained as clean and stable as if it were next to the power supply. 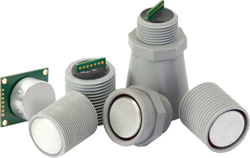 Standard MaxSonar® sensors have seven pins to provide access to multiple output options and for the application of power and ground. Figure 2: Shielded Wire shows that the wire attach option has seven conductors to match the pin out. MaxBotix Inc provides a color guide to match the wires to the sensor pinout to allow easy recognition of the wires. The color guide can be seen in the shielded wire datasheet and the sensor pinout on page two of the relevant sensor datasheet. One length of wire may not fit the needs of all applications. A standard wire attach option includes three feet of shielded cable, however, you can order and have an additional wire attached to your sensor per the needs for your application. For applications where a custom or specific wire is to be attached to your sensor, please contact the MaxBotix® Inc., Sales Team.